With US equity indexes closing lower for the second consecutive day, the VIX broke upward (intra high 15.71), settling +9.2% @ 15.42. 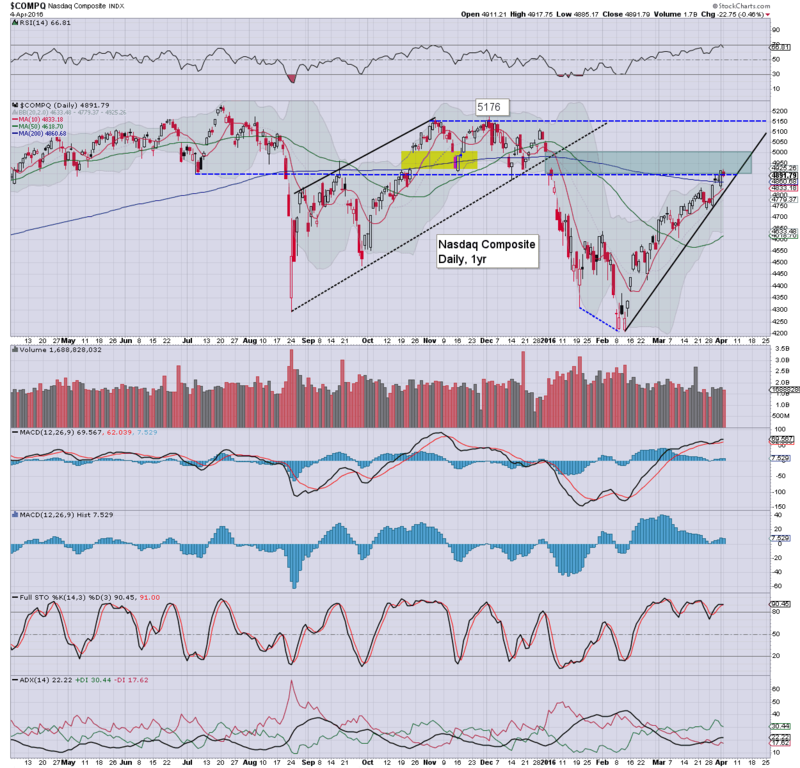 Near term outlook offers the sp'2020/15 zone, and that should equate to VIX 18s. 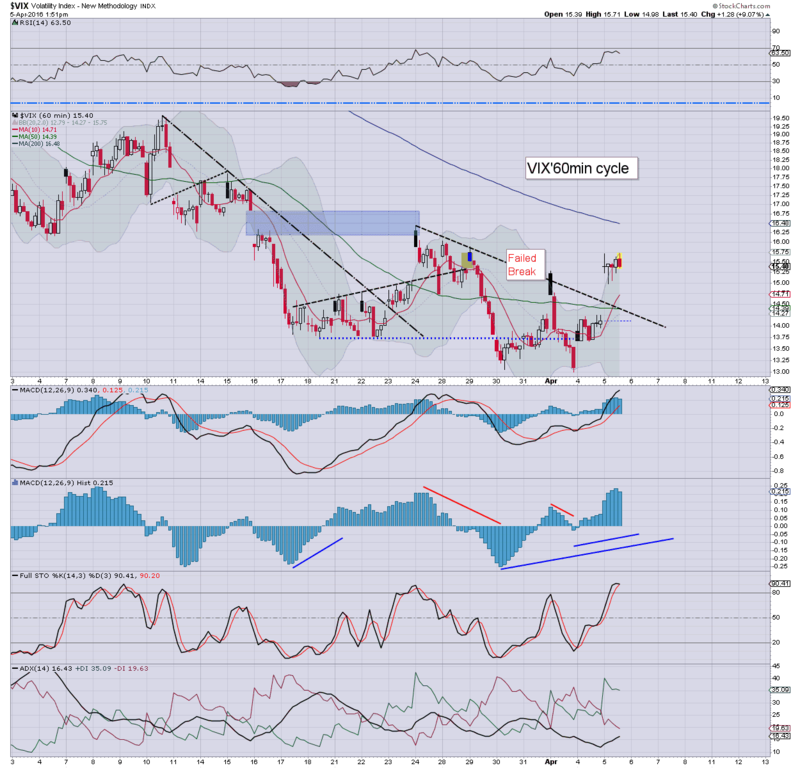 Sustained action above the key 20 threshold looks out of range in the current cycle. Suffice to add, a second day of declines for the equity market, and the VIX was naturally higher for a second day. 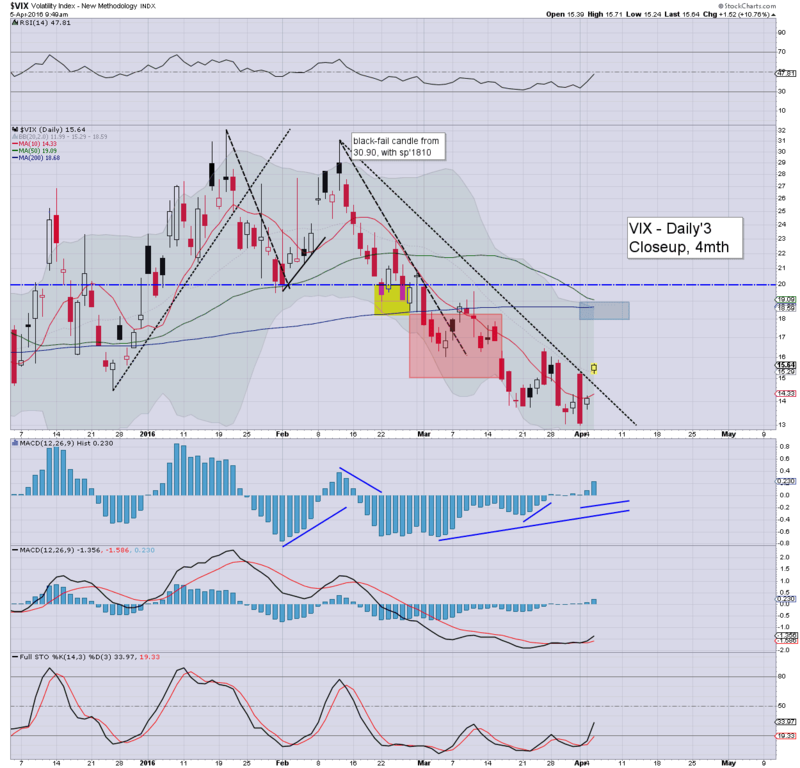 VIX 18s look due... perhaps the 19s, but any action >20 looks overly difficult. 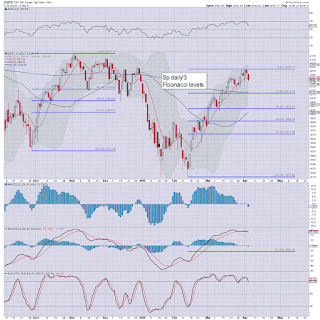 US equities indexes closed broadly lower, sp -20pts @ 2045. The two leaders - Trans/R2K, settled lower by -0.6% and -1.1% respectively. 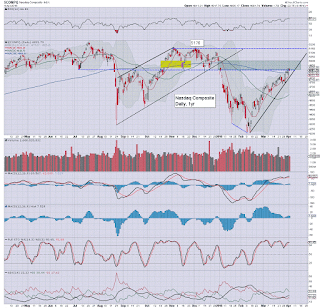 Near term outlook offers the 2020/15 zone - where the 200dma is lurking. 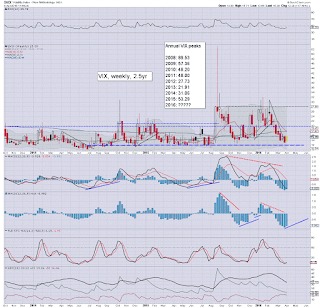 Sustained price action <sp'2K and >VIX 20 looks out of range in the near term. *closing hour action: a fair amount of chop, but leaning rather weak into the close, breaking the Friday morning low. ... a somewhat interesting day, but the market is still somewhat frustrating - from a bearish perspective, as we're only just beginning to see some significant downside. All things considered, the sp'2020/15 zone, with VIX 18s, looks a realistic target.. whether tomorrow... or a little later this week. 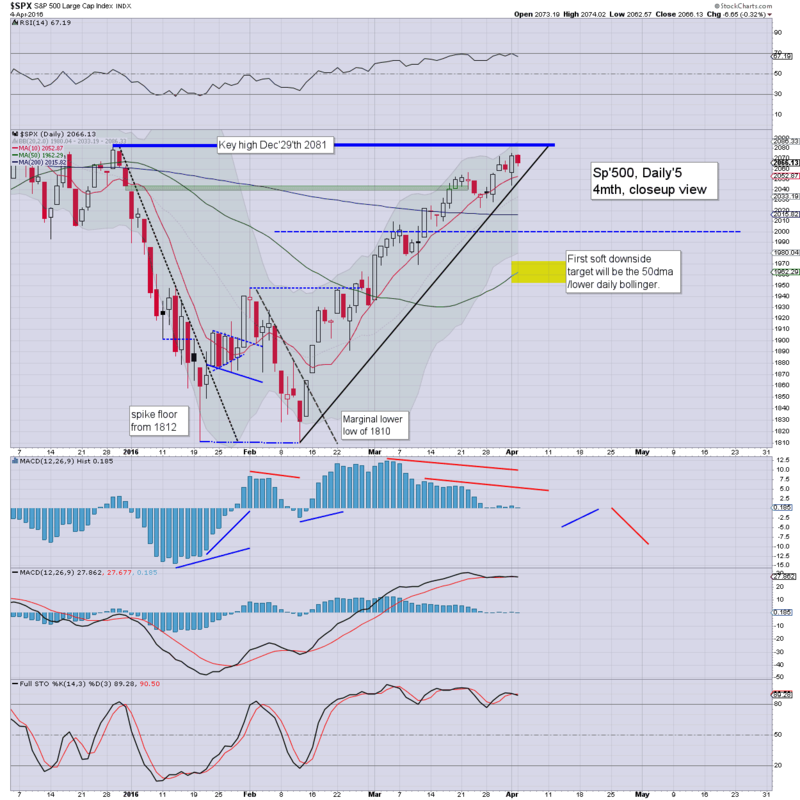 *I remain short the sp'500, and long-VIX, and want to close out before the weekend... not least as the market will likely be somewhat choppy across the next few weeks. 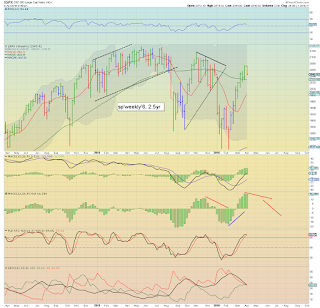 On no realistic outcome does any serious downside to the mid/low sp'1900s, look viable until late April.. if not May. US equity indexes are only moderately lower, but it will still make for the second consecutive net daily decline. Whilst the sp'500 is yet to break the Friday low of 2043, the VIX is offering a slightly stronger indication that the market will continue to cool across the next 2-3 days. 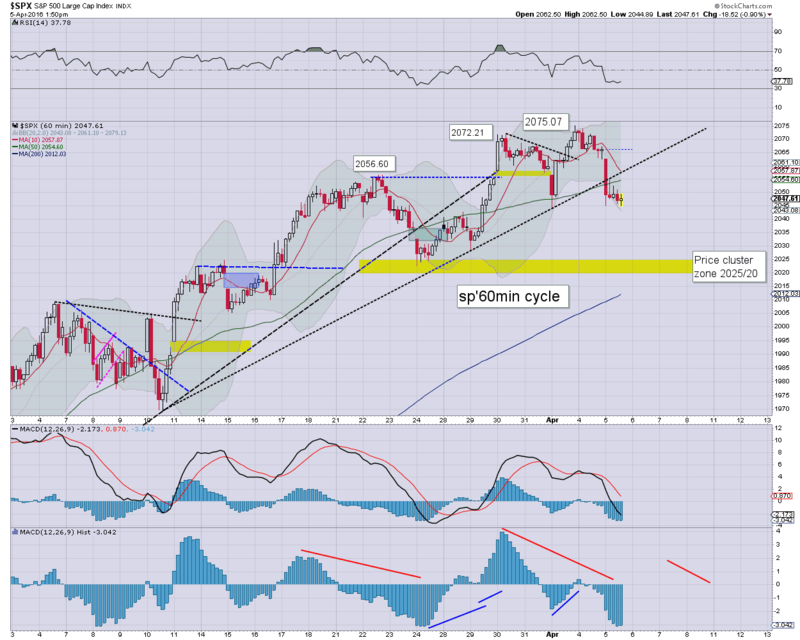 US equities remain broadly weak, and with two hours left, the market has another viable down wave into the close. A test of the 200dma - currently around sp'2015, seems very viable this Thurs/Friday.. along with VIX 18s. 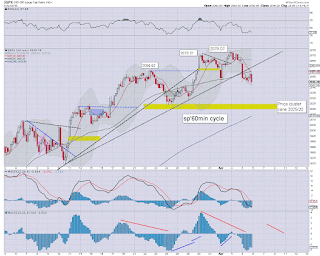 Sustained action <sp'2K and >VIX 20 look out of range in the current initial retrace. Lets just see how we close... which will surely be a red one! US equities remain broadly lower, and it would seem just a matter of whether the VIX will break into the 16s by today's close... or tomorrow. 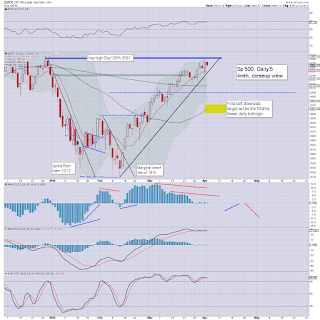 In either case, the market is seeing a natural intial retrace of the ramp from sp'1810-2075. Unlike last Friday, the market is unable to rally.. and we look set for a second day of net declines. 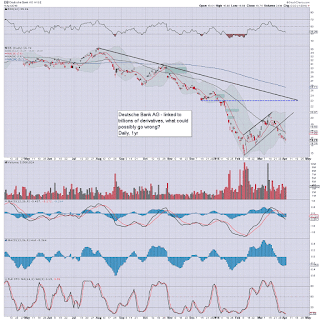 As things are, I am trying to be patient, but will get twitchy around sp'2025/20.. with VIX >17.50. Q. 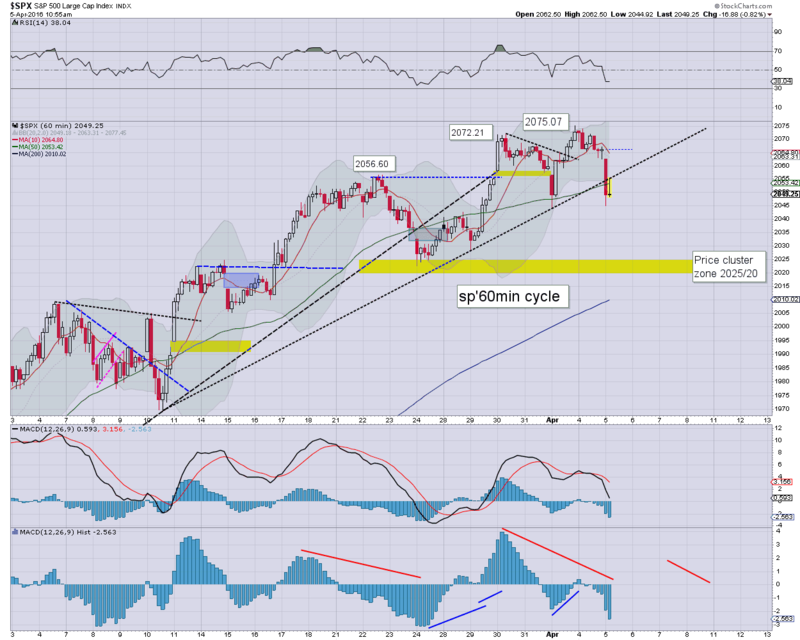 Could we perhaps fall further to the 38% fib.. around 1980/75, as happened early last November? A daily close in the sp'2030s - with VIX 16s, looks increasingly viable, as price momentum is swinging back toward the equity bears. More broadly, the 2020/15 zone - where the 200dma is lurking, along with VIX 18s, is probable before the weekly close. Note the VIX MACD (blue bar histogram) cycle, its going to take until at least early May, before we turn positive cycle again. 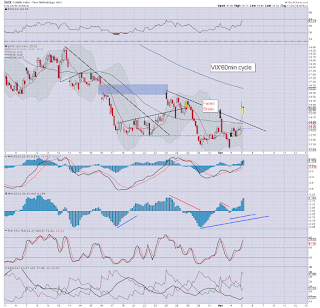 There are multiple aspects of resistance around VIX 18, sustained action >20 looks out of range in the near term. 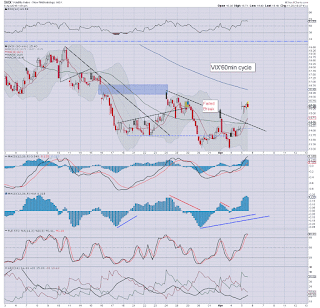 notable strength... TVIX +7% @ $4.70, the mid 5s look probable in the current cycle. 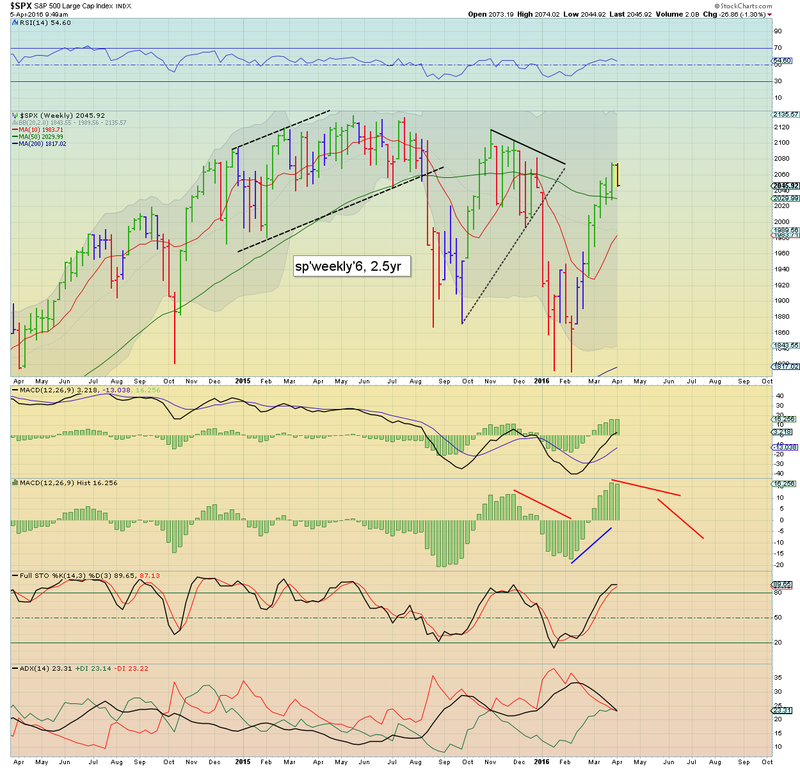 US equities remain weak, although clearly.. some of the bull maniacs are still in buying mood. 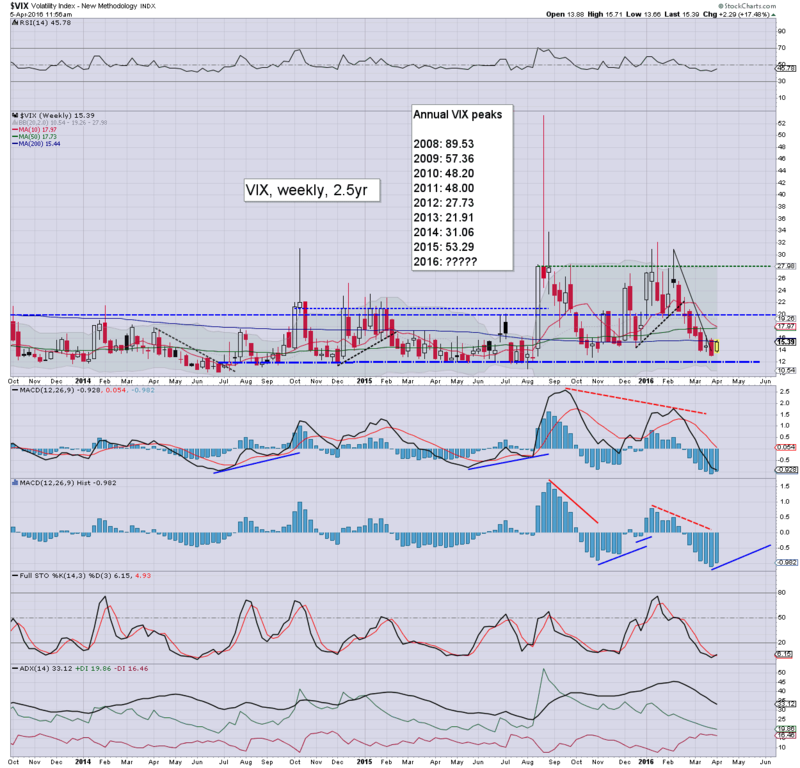 Broadly, the market should continue a run to at least the sp'2020/15 zone - with VIX 18s, within the next few days. With market weakness, the metals are catching a bid, Gold +$12, with Silver +1.2%. *yes.. the early bounce concerned me... if only for a few minutes. Broadly... the market looks set for a second net daily decline.. the only issue is whether we settle in the sp'2040s.. or 2030s. 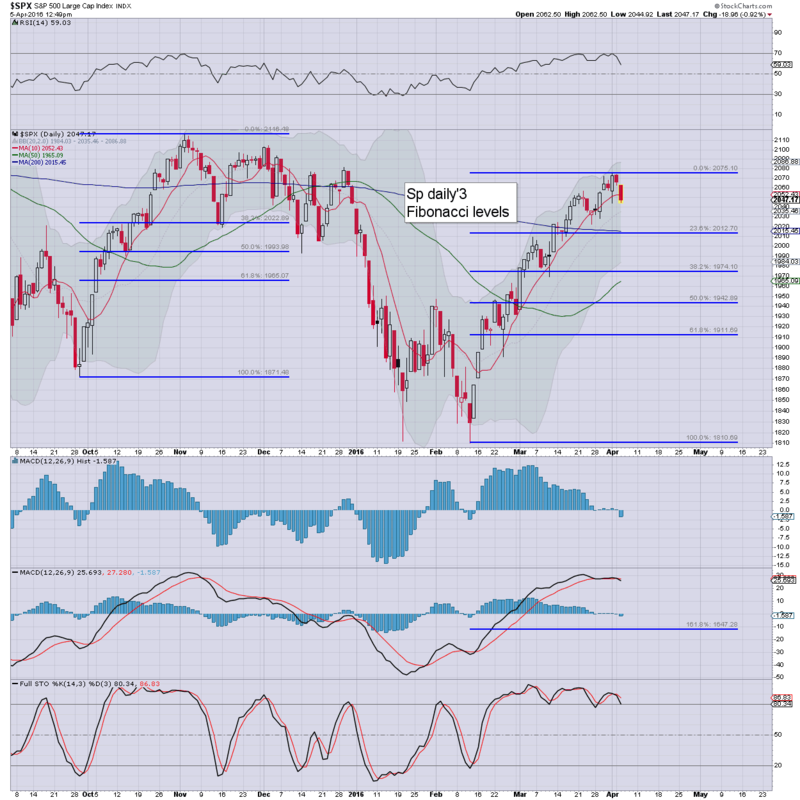 Considering increasing downside momentum... the 2030s look viable, if not probable today. I would imagine Trump will have something to say about that. 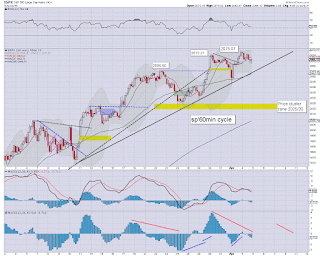 US equities open broadly lower, with clear breaks of trend across a number of indexes. 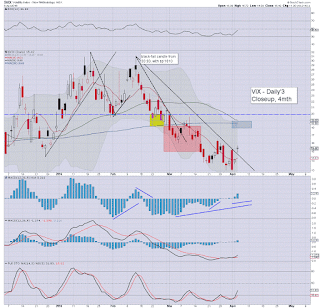 The VIX has already broken above last Friday's high, currently +10% in the 15.60s. 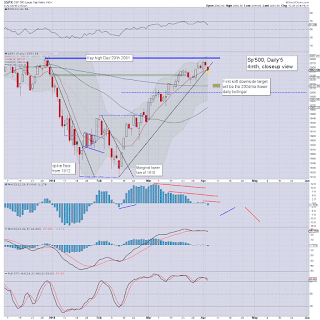 The sp'2020/15 zone - with VIX 18s, look a valid target within a few days. We have clear breaks of trend on the bigger daily cycles, but it will be some WEEKS before we have clarity that the series of 'marginal lower highs' - from May'2015, will remain intact. To be clear though... 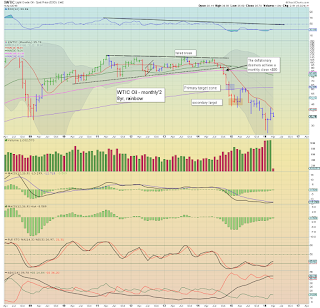 I would refer ANYONE to the price action of last Nov/Dec'... that is what seems probable across the next few weeks. 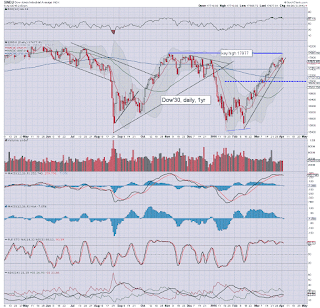 On no realistic outlook does a straight run to the mid/low 1900s look viable in the near term. yours.. short.. but looking to close out this Wed-Friday. Good morning. US equity futures are broadly lower, sp -16pts, we're set to open at 2050. 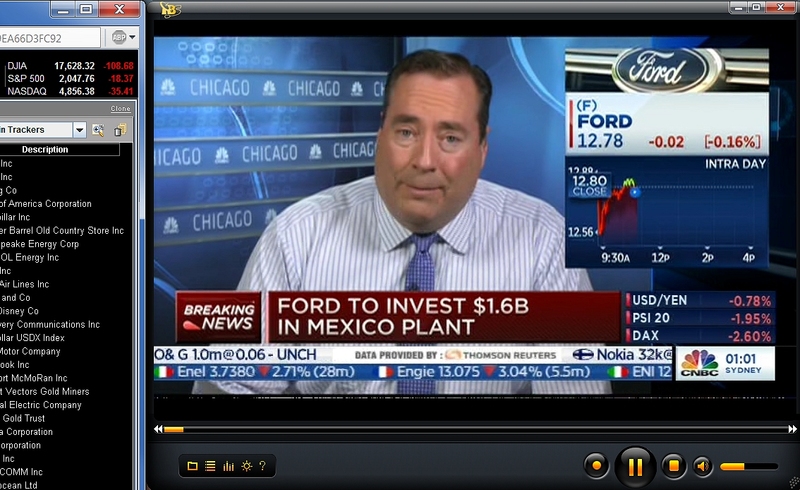 USD is +0.2% in the DXY 94.70s. Metals are powering upward, Gold +$15, with Silver +1.4%. Oil is choppy, -0.1% in the $35s. 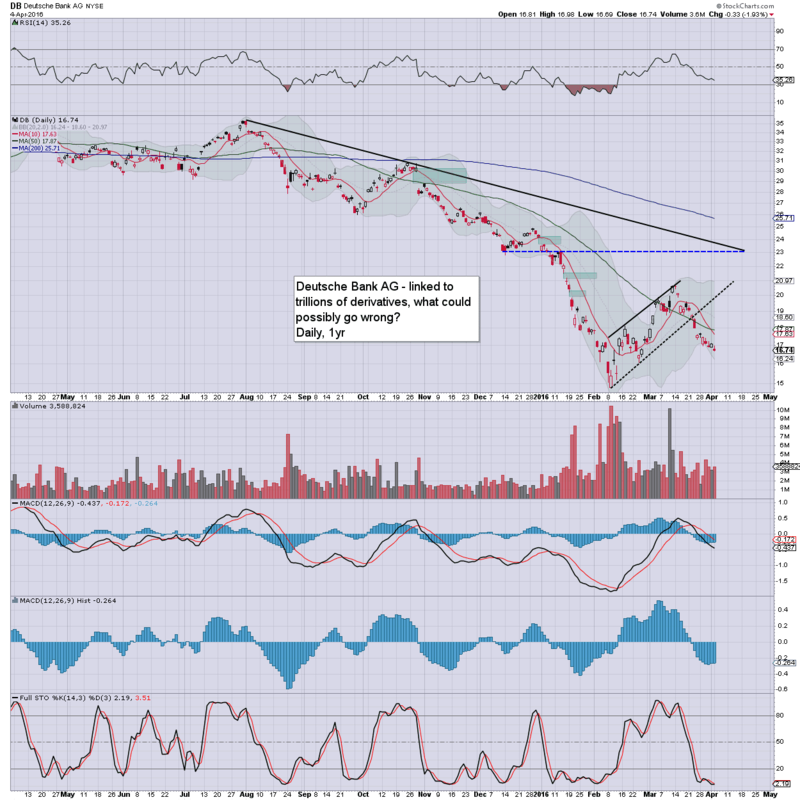 Most important of all... we're set to break rising trend at the open. Best guess... a daily close in the sp'2045/40 zone. 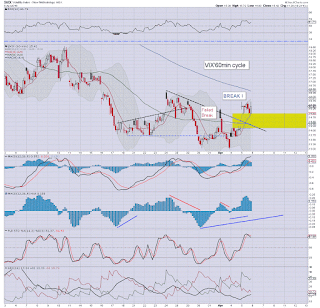 There will be high threat of some latter day recovery, but it should merely result in a bear flag being made... offering further weakness to the 2030/20s tomorrow. We've not forgotten about DB, have we? 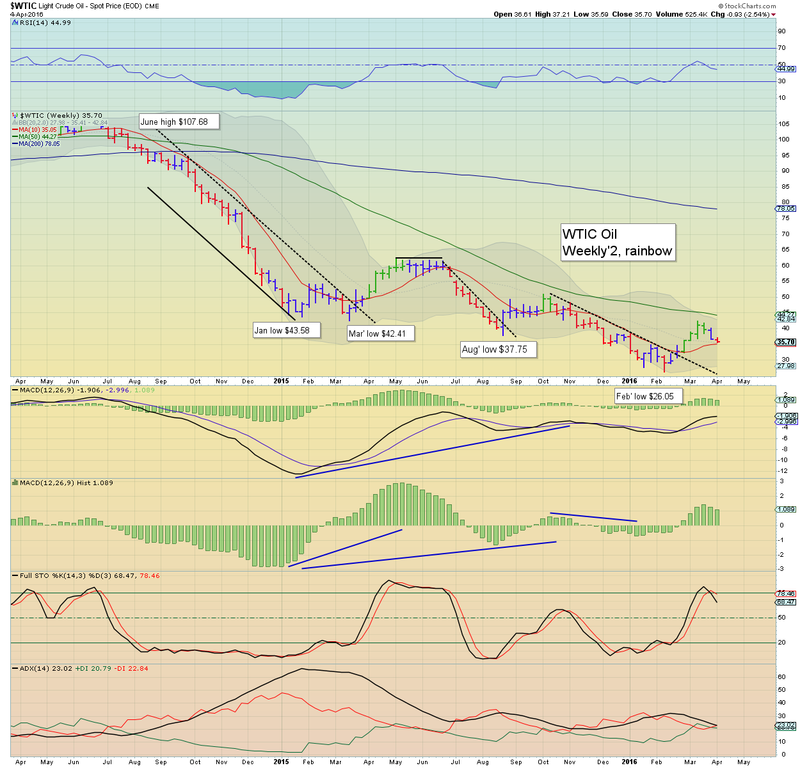 Since the Feb'11th low of $26.05, WTIC oil has seen a powerful ramp to $42.49, but is now already back in the $35s. 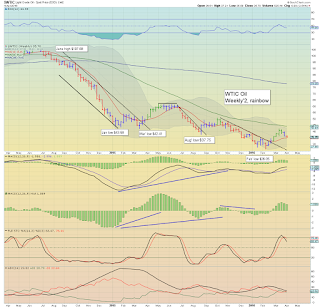 Chatter is already starting to increase that Oil will be trading back near the recent lows within a month or two. What should be clear, the issue of over-supply remains entirely unresolved. 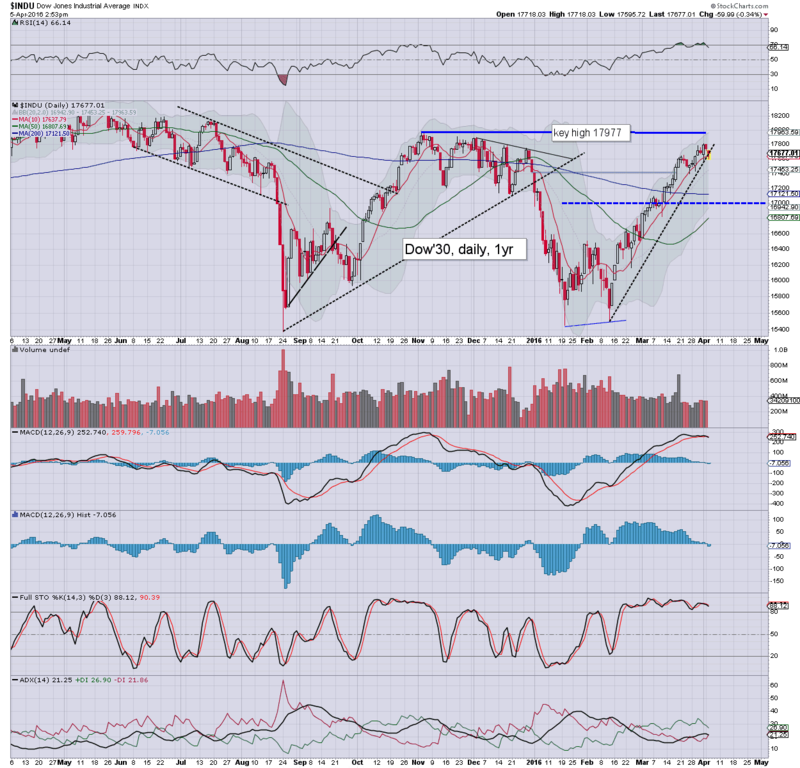 re: weekly: note the first red candle since early February. 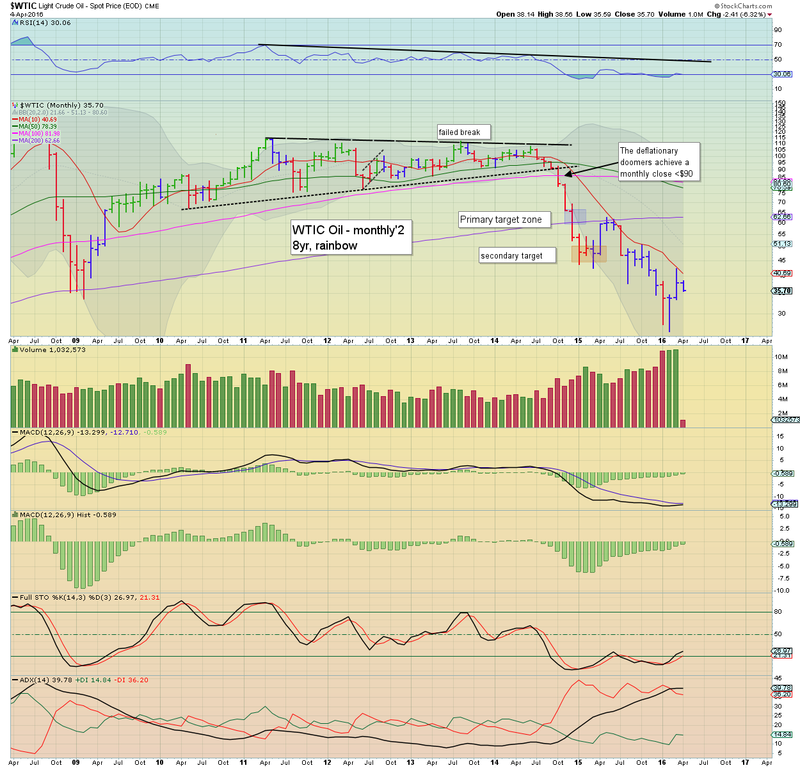 re: monthly: the monthly 10MA is holding the line... and unless oil bulls can attain an April/May close above the $40 threshold, the strong downward trend remains fully intact. Tuesday will see intl' trade, and the latest PMI/ISM serv' sector data. 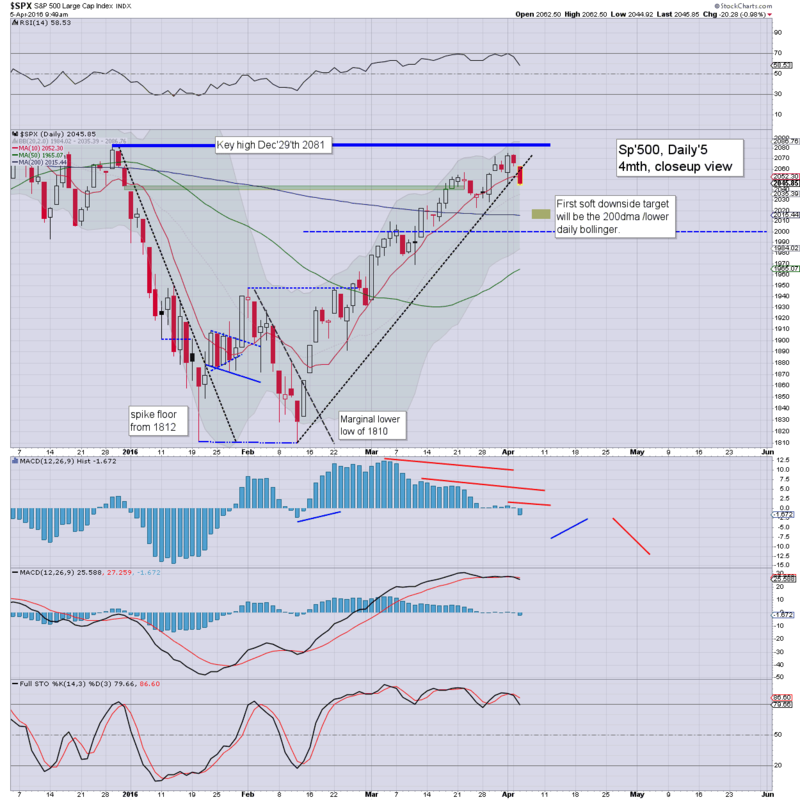 US equity indexes closed moderately weak, sp -6pts @ 2066 (intra high 2074). The two leaders - Trans/R2K, settled lower by -0.9% and -0.8% respectively. 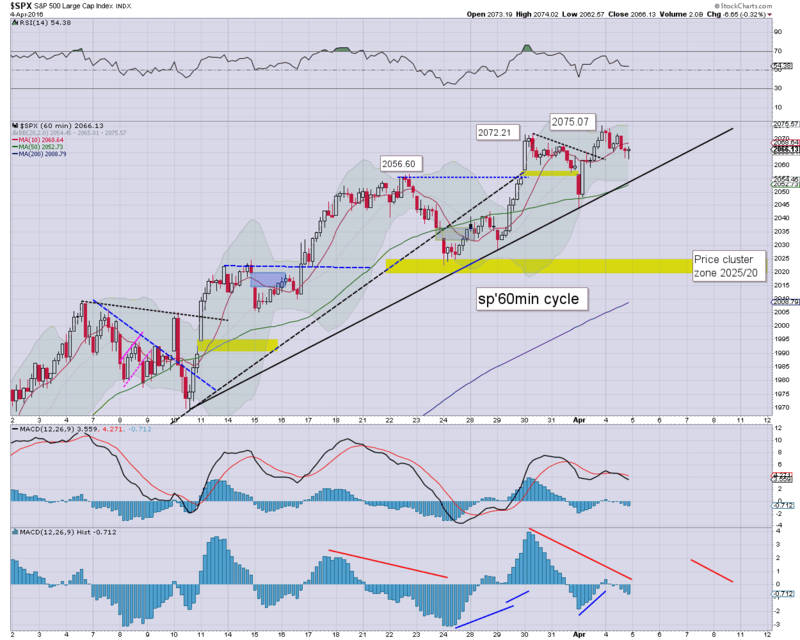 Near term outlook offers the sp'2020/15 zone... once rising trend/support (sp'2055 at the Tuesday open) has been broken. 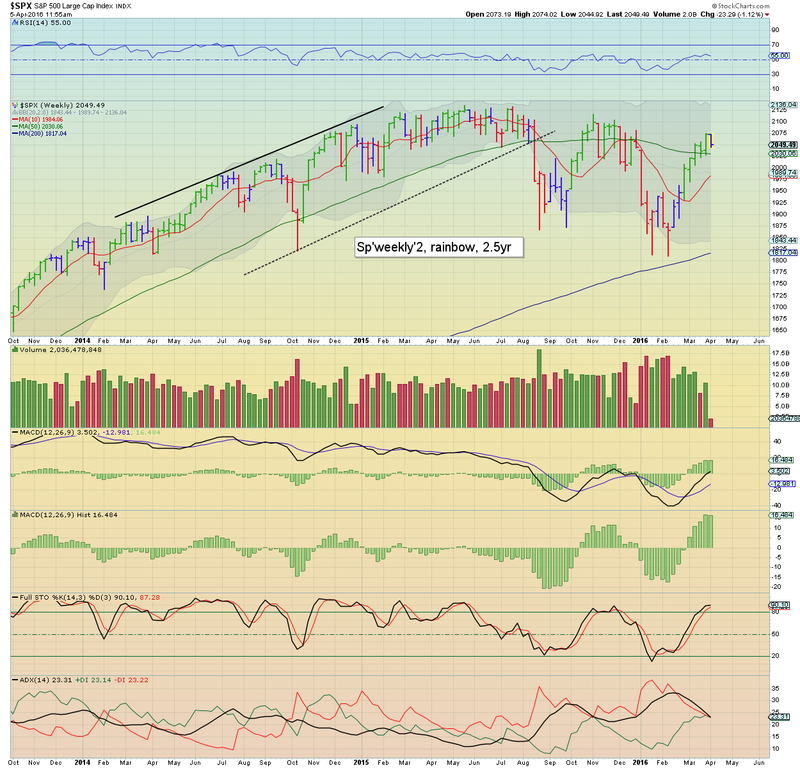 The broad upward trend from the Feb'11th low remains intact. 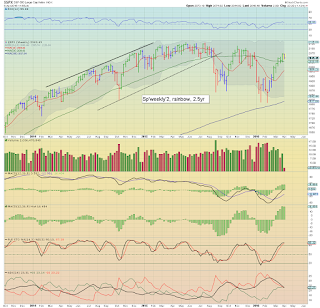 However, a 4-5% retrace for all indexes is due.